On January 2, 2018, at the Cameroon Baptist Convention (CBC) headquarters in Bamenda, I handed over the supervisory role of the Director of Finance and Development to Mr. Ntam Ephraim (standing to my right in the photo). This was in line with the intention of the CBC to have a Cameroonian national head the department. Since 1994 I had been the supervisor of the then-called Central Accounting Office, now called Department of Finance and Development. I’m thankful for the privilege to have had this responsibility, which endeavoured to see that the accounting and cash flow management of some 160+ departments of the CBC was being carried out with God-honouring diligence and integrity. I will likely not miss the ever-present challenge of cash demands for ministry being greater than cash supply, nor will I likely miss dealing with difficult personnel issues. What I will miss is being on the cutting edge of how ministries are faring for God’s Church – how God is providing. With God’s help Mr. Ntam will be able to carry out these responsibilities. My new role is still in the Finance and Development Department, but as Cooperating Missions Accountant and Resource Mobilizer, seeking to ensure all funding from abroad is well stewarded. I’m also currently working on updating the CBC Financial Regulations so that the accounting system and software transitions of the last year are integrated into them. Once this is done I expect to be involved in a lot of training seminars using the updated regulations. The unsettled political situation in English Cameroon is having an adverse effect on business, including Florence’s dental practice. So, she has tried to diversify by engaging in small scale vegetable farming in the hills outside Bamenda. It gives employment to a few people and has been an interesting learning experience. The uncertainty and unrest have driven the Church to put more emphasis on prayer. Many groups within the church are intentionally scheduling more prayer time. It has brought Church denominations closer too. 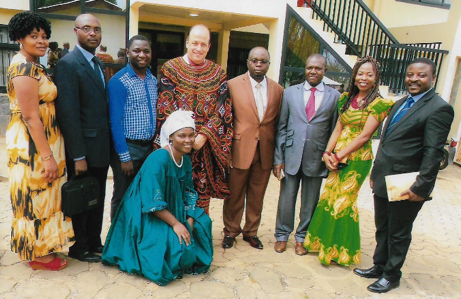 In January, the Catholics, Presbyterians, and Baptists in Bamenda observed a week of prayer for Christian unity with a session at each church. It was very heavily attended. At the prayer services, the Catholic priest led at the Presbyterian church, the Presbyterian pastor led at the Baptist church, and the Baptist pastor led at the Catholic church – something that has never happened before. We remain humbled and appreciative of the support, prayers, and encouragement from the body of Christ in North America. It is an honour to be sent by you and represent you in Cameroon.